The first weekend dry enough to start the outdoor climbing season! 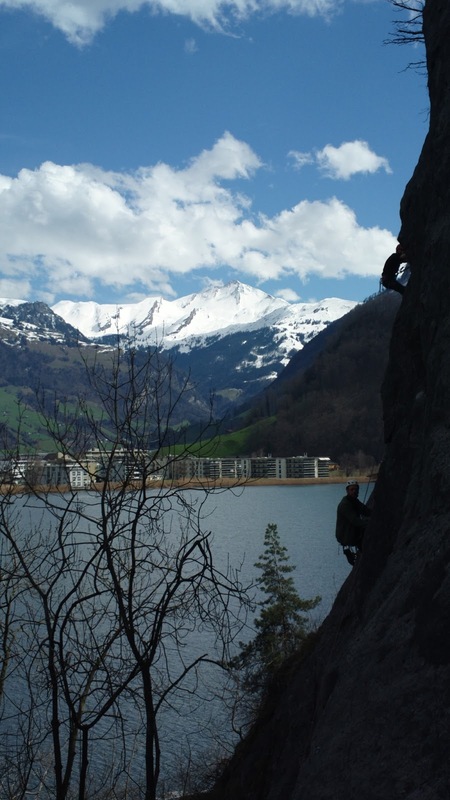 Anita, Anton, Andrey, Alex, Linus, Ivan, Volodymyr, Sonja and I went climbing the Rivella near Stansstad, directly on lake Lucerne. One of the area's advantages is a very convenient approach in the form of a short stroll from the train station. The climbing is varied on good limestone. There's a choice of about 50, mostly single pitch, routes graded from 3b to 6b+. You can scramble up easy slabs or challenge yourself on slightly overhanging walls with tiny crimps. Today we discovered that my rope, which I believed to be 60m, is not. Luckily Linus, who was belaying me at the time, was paying attention and noticed we were running out. Thanks man! This could have turned ugly. Anyway, a bit of creativity and I came down without problem. From now on we dutifully tied off the end of the rope. Some of the routes have two anchors, but we still climbed all of them as single pitches. This meant that we often used the full rope up to the last couple of centimeters. Long routes - good for endurance! It was Anita's first time on real rock and we did some rappelling and easy slabs. Fun.